I've always been quiet a light sleeper, I think it comes from nearly always living in the countryside away from main roads and noise. I remember being in my early teens and hearing glass smashing at about 4 in the morning. I was out of bed like a shot, straight into mum and dad, to give them a mild heart attack, before going down stairs with dad. Him in front me behind (not sure what I would have done). "Sorry!" The milk man rather sheepishly said as he raised his hand. It took a while to go back to sleep after that! I'm the same now, I have no problem falling a sleep and do so in a matter of minutes, but I'll wake up if a squirrel farts in the garden! My wife is the polar opposite however. Last night was a perfect example of that. I woke up around four as it was blowing a gale and I could here something bashing around outside. 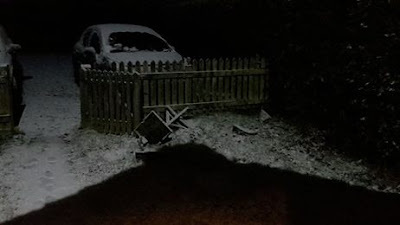 I popped down stairs to see what it was (the meter cupboard door for the electric had come open) and then decided to just go outside and check nothing was blowing around in the extension (wellies and boxer shorts is a good look for a night time prowl in the snow!). I then went back upstairs and to the loo where I rather clumsily knocked a pack of tissues into the bath, it made a terrible racket, woke up the boy who then cried for 5 minutes before settling back down. I got back into bed and my wife hadn't even stirred! Who else is a light sleeper? Or who could sleep through an earthquake? I think it's a good trait to have when you're looking after your little homestead though. teehee! one of our stray cats wakes jambaloney every morning at about 4amish...apparently he comes to the bottom of the bed and makes a little cry...i never hear him! jam gets up, opens a tin of food and then the other 3 strays wake up and cry for food! considering that they get fed about 12 times a day and they have bowls of snackedy-mows all over the house and they are all fat beyond belief...but hey what can you do? sending much love to you and that beautiful family of yours! and can you get me your neighbours' phone number? i bet they have some good stories to tell about boxers and wellies - bahahahahahah! Good thing that didn't happen here. I'd probably have put 10 rounds through the milkman and then had to go dig a hole in the middle of the night. I don't like things that go bump in the night. We're exactly the same. I'm awake in a flash, but my wife would sleep through WW3. Last night I thought I hear a horse run past (I'll see when it's light), and later the dog woke me up (Possibly barking at a loose horse). Hi there when we lived at the coast we had an earthquake ,the beds were moving and the girls crying , at first we thought the roof had caved ran outside and all was okay, neighbours were all out and were saying it was an earthquake.we realised our son had not made an appearance ran to his room and he was fast asleep. Told him the next morning and he said i missed it and whens the next one! I'm a fairly light sleeper too. What wakes me up is the cats sometimes, playing with various toys in the night,or, most commonly a change in wind direction that makes the motorway noise seem louder,or about 3.30 in the morning, the traffic builds up on the motorway, that wakes me up,often once I realise what has woken me up, can sometimes get back off to sleep. I live about half a mile as the crow flies from the M1. I sleep through any noise, but if a light comes on I'm awake. My hubby in the past has got up in the early hours on a call out in winter, he will come back a couple of hours later and get into bed and I slept through it all. I can sleep through just about anything. At boarding school it was thought that there was an intruder in the school. Apparently there were cute police officers searching everywhere. I didn't wake up. On the other hand, when ours sons were little I woke up any time they made a noise. The little guy sleeps in our bed beside me and nurses All. Night. Long. Plus we have two roosters. So I haven't slept, period, in a very long time. I'm like you ! I would've been out there with a torch securing the meter cupboard and then taking ages to go back to sleep ! I'm like you hear everything. I blame years of shift work and a husband who could win a gold medal for snoring!